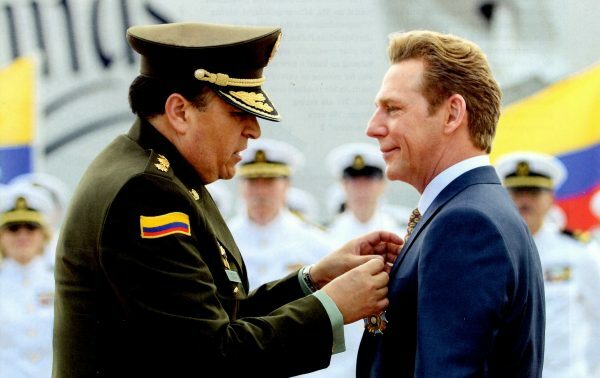 Retired Colombian Police General Carlos Ramiro Mena Bravo presented an unauthorized medal to David Miscavige. Outraged has ensued in Colombia over giving an American cult leader an undeserved and unauthorized medal. An investigation of this insult to Colombia in underway by the authorities. With that kind of shocking human rights record in Colombia, Scientology may have seen an opportunity — similar to the way Scientology sees opportunities for public relations operations and recruitment at the scene of natural disasters in other parts of the world. Sandra and Felipe Poveda are a brother and sister team and IAS Freedom Medal recipients. Sandra founded Youth for Human Rights in Colombia and her brother is its president. 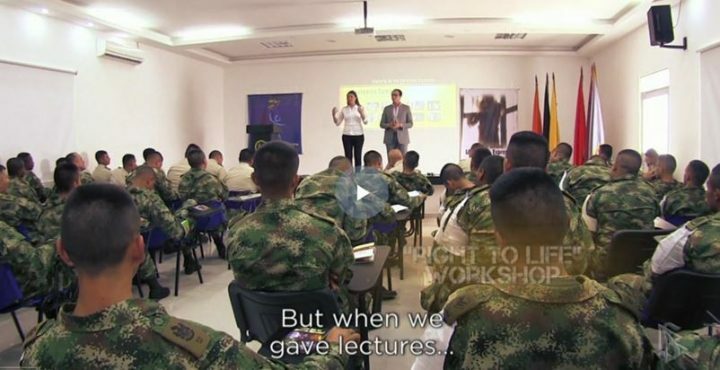 In a Scientology-produced video, the Povedas claim to have used Scientology’s Human Rights program to intervene in the serious matter of extrajudicial killings of civilians by the Colombian Army. As a result of their program, the Povedas say that civilian complaints against the Army dropped 96 percent. I see in this absurd Scientology narrative a cynical attempt to shift the blame for extrajudicial killings onto common soldiers who did not know right from wrong. For its part, Scientology got access to compliant soldiers for its public relations purposes. The military, meanwhile, had evidence that it was doing something about human rights in the wake of the extrajudicial killings. Back in the US, Scientologists were led to believe that the campaign was making a difference across the entire nation of Colombia and were thereby induced to make further donations. This same pattern has been used by Scientology with the Los Angeles Police Department and other police agencies in the US. These agencies distribute Scientology’s free anti-drug booklets and videos. In return, Scientology receives PR photos of smiling cops holding Scientology booklets. The police officers are generally photographed with local Scientologists officials. (We covered this in a previous story at the Bunker.) Just as we see photos of smiling LAPD senior command officers with Scientologists we see the same in Colombia. For years, Scientology used Colombia as a prop until things unraveled after David Miscavige had retired General Carlos Ramiro Mena pin a medal on him at the end of this year’s “Maiden Voyage” celebration on June 23 in Barbados. Mena may have violated rules by being in uniform, and for taking the medal to Barbados. Scientology has argued that the decoration was already approved by the director of the National Police, General Jorge Nieto, and that it took place in Barbados because Miscavige couldn’t pick it up in Colombia. But we’ve learned something new about Mena that puts his participation in a new light. 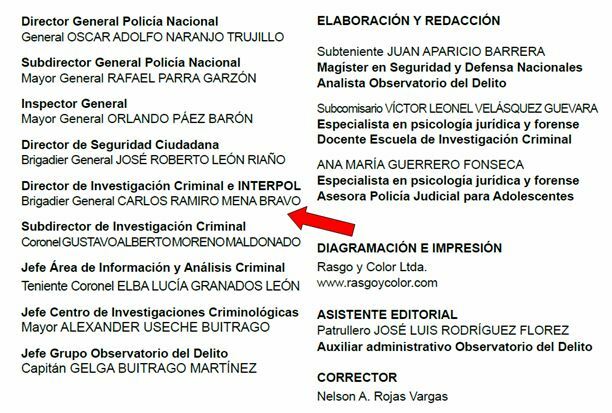 Mena was a powerful official in Colombia, and according to a listing of National Police personnel, he was the Director of Criminal Investigations for Interpol in Colombia. In other words, he had access to global Interpol databases while he was associated with the Church of Scientology. Longtime Scientology watchers will no doubt understand why this grabbed our attention. Scientology has long been obsessed with Interpol. L. Ron Hubbard was consumed with paranoia about what Interpol was saying to law enforcement agencies around the world about him. His Guardian’s Office made Interpol a key target during its “Snow White Program” in the 1970s, and Scientology commissioned writer Omar Garrison to pen a 1976 book attacking the agency, The Secret World of Interpol. It’s fascinating to think that Miscavige had influence with a Colombian general who had access to Interpol’s files — and enough influence that the general would risk his retirement to pin a medal on Miscavige. Yesterday, we learned from the Bunker’s correspondent in Bogotá that Colombia’s senate is showing a united front to have Scientology seriously investigated. We can only hope they go down many different avenues, including the things Gen. Mena might have been doing for Miscavige that we don’t know about. Yet. 2. General Mena has significant connections in the Colombian government, Interpol, NATO, and the US military. For Scientology to have such a powerful connection raises many disturbing questions. 3. We did a guest piece on the Underground Bunker which showed that the Dianetics Center in Medellin was located right next door to the home where Pablo Escobar was shot and killed by Colombia’s elite Search Bloc troops in 1993. We linked to a tourist video on YouTube which showed the Mission. We note that shortly after our story was published the entire YouTube channel where the video was located was taken down for violating terms of service. This was strange as it was an old account with little traffic. Perhaps it was inconvenient for David Miscavige to have the Colombian public reminded that he had a Dianetics Center next to the Pablo Escobar death house in Medellin even as he was receiving a dubious and unauthorized medal from the retired Colombian National Police General Mena. 4. I have been following the story of the extrajudicial killings in Colombia for many years. What I see in the Scientology component of the killings is essentially a form of collusion between the Colombian military leaders and the Church of Scientology to shift the blame for extrajudicial killings onto common soldiers, i.e. an attempt to say that no one in particular really did the killings. The Colombian military has painted a picture of a pervasive lack of training in which inexperienced soldiers, literally raw young recruits with AR-15’s, were fighting hardened FARC guerillas. So naturally there was going to be some False Positives. However, the military protests, there were no organized death squads, no guerra sucia as happened in Argentina. These are not “disappeared ones” they are simply False Positives — and this due to a lack of training combined with the extreme problems of positive visual identification in jungle warfare. Add the fog of war to a lack of Human Rights training and there were bound to be problems: Shoot first and ask questions later. 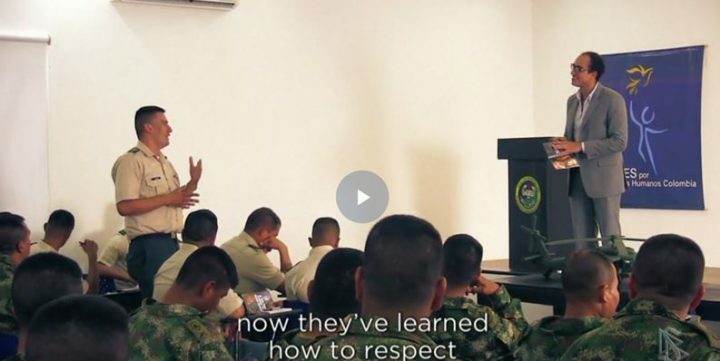 This simplistic narrative allows the Scientology component of Human Rights education to prove that the Army is bringing in an outside religious group to teach the soldiers respect for human life. Over against this, there in an intense pushback from the Army on any prosecutions. IMO, this is a long game for the Colombian Army in which it has to distance itself by a least a decade from the killings which ended in 2010. One way to shift the narrative from “what happened” to “what we’re doing about it” is to shift the focus onto Human Rights education provided by Scientology. Yet this begs the question: Why doesn’t the Colombian Army or Police bring in Colombian experts and teachers on Human Rights? Why do they need an American Cult to do this work? While the current focus in Colombia is one of whether or not tax dollars were spent on Scientology, I would like Senator Cepeda look at the false narrative Scientology helped the military and the police create. …General Alberto Sepúlveda was at the main table of this event and even had a conference in which he said that Sandra Poveda, Scientologist and director of the NGO to which the agreement in Colombia was terminated, is the “guardian angel” of the Army in the field of human rights. “I want to confess that with Dr. Sandra Poveda here present, who is our guardian angel in Colombia on these human rights issues, human rights matter in the National Army (…) We have a series of documents, directives, clues so that our Soldiers learn to do what human rights are(…) and it has been in the hands of “partners” as Young People for Human Rights that we have managed to grow on this issue deeply. Well, you see some of the training for our soldiers there. We have trained them with thousands of soldiers, officers and non-commissioned officers in our jungles, “said General Sepúlveda. The praise of the leaders of Scientology towards General Sepulveda did not remain there, Fabio Amicarelli, director of humanitarian programs of the Church of Scientology, congratulated General Alberto Sepúlveda for the success of the Army and Scientology, working together. By training thousands of soldiers, there is a dilution of the killings and a re-contextualization of the killings as a lack of training spread across many years. That an Army official ascribes “guardian angel” status to Scientologist Sandra Poveda is ridiculous. Again, is there no one in the Colombian military that can do this work? Or are certain officers in the Colombian military in the pocket of Scientology? General Sepulveda is absurd. He seems to be reciting a script written for him by Scientology. IMO, such ridiculously effusive praise betrays a hidden agenda. Scientology made it very easy to do. What Scientology offered the Colombian military and police was a “plug and play” curriculum of free and readily available booklets and videos on Human Rights. All the military and police needed to do was hand them out and take PR photos to show they were doing something about human rights in response to the extrajudicial killings. This was of course window dressing given the fact that no high-ranking Colombian officers or political leaders have ever been convicted in the killings. In exchange for its literature and videos, Scientology received a great deal of PR which it then used for internal fundraising. 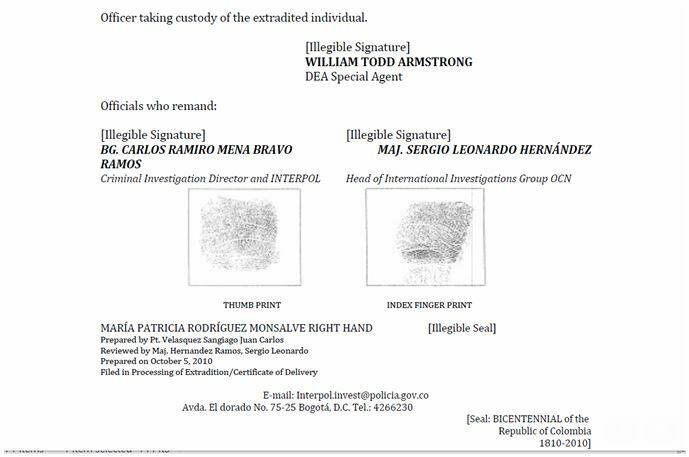 This gives us another avenue of investigation: Ask Amnesty International what it thinks of Scientology’s cooperation with the Colombia military and police. We intend to pursue this matter. This Amnesty International headline would seem to put the lie to Scientology’s claim to be Human Rights champions in Colombia. If anything, it makes Scientology look like the Army’s PR unit. to FARC combatants and the waiving of criminal prosecutions for security force personnel not under investigation for or convicted of crimes under international law. Those who had served at least five years in prison for crimes under international law will, under certain circumstances, be conditionally released. Ambiguities in the law could result in many human rights abusers evading justice. The war between Colombia and FARC was bankrupting the nation. One figure showed that the Colombian government had to spend $3.9 million USD per day. The costs over two decades was around $12 billion USD. Another part of the damage was the reputation of the Army and the Police for the extrajudicial killings. The missing links I’m exploring are those between the Colombian Army, the Police, and Scientology. The Colombian military and police needed a solution, they needed an outside party who would cooperate in what is, imo, obviously a false PR narrative. I say this because, as noted, Amnesty International and other real Human Rights groups would not participate in this Colombian Army-Police PR show. General Bravo is one of the Shadowmen. He was, after all, the third highest ranking police official in Colombia. He has ties to NATO and the US Army as well. I have a feeling that this is a big and deep rabbit hole which has been located and this story is just beginning. We need a Robert Mueller here in America to investigate Scientology and Columbia. It may be that Scientology is violating US State Department rules by working with a foreign power in the manner that it is.